2 cloves of garlic (minced), ½ cup sour cream 2 ½ cups chicken broth, 15 oz can Northern beans, rinsed and drained, ½ cup milk, Salt and pepper. In a large skillet over medium heat, cook the bacon until crisp. Remove with a slotted spoon to a paper towel lined plate. Drain all but about 2 Tablespoons of the bacon grease in the skillet. To the hot bacon grease, add the onion and cook until softened about 5-8 minutes. Add the garlic and cook for an additional minute. Pour in the chicken broth and milk, bring to a boil. Once the liquid is boiling, add the dry pasta and reduce the heat to medium-low. Cover the skillet and allow the pasta to cook until al dente, about 15 minutes. 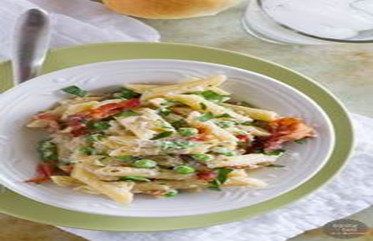 Once the pasta is cooked, add the peas and continue to cook until they have defrosted. Stir in the sour cream and the reserved bacon and drained beans. Taste and season to taste with salt and pepper. Serve immediately, topped with parmesan cheese. Add a piece of fruit for a complete meal. Would you like to answer our poll? Go to our Facebook page "Holmes County General Health District". Look for this recipe attached to our "poll" and answer yes or no. Thank you!